It's a lot quicker to scan doujinshi stationery than it is to scan artbooks... So here's another beautiful letter sheet from Raspberry Putty's You Khosaka for you. This time featuring some beautiful Advent Children designs. Browse You Kousaka Gallery: Recent | Popular. The trace is so joyful and delicate! Sephy looks great! The layout is very smart! WOW! this one looks amazing. I like the watery background. All the characters looks very pretty. thanx for sharing. Man, you just keep em coming, don't you? pretty colors makes the scan cute! The artwork is so beautiful. Where do you find such amazing work? Gorgeous scan saikusa! A lovely piece of artwork. I love the drawing style they seem more childish or innocent in a way and the watery background is really nice. Thanks for sharing these beautiful artworks! Saikusa,san, so many beautifull scans youve been sharing with us. I've never seen this picture before, is so pretty. I loved the Harry Potter's doujinshi too. Thank you so much for sharing ! but where do u all get this kinda pictures ~ ? this is so beautiful! 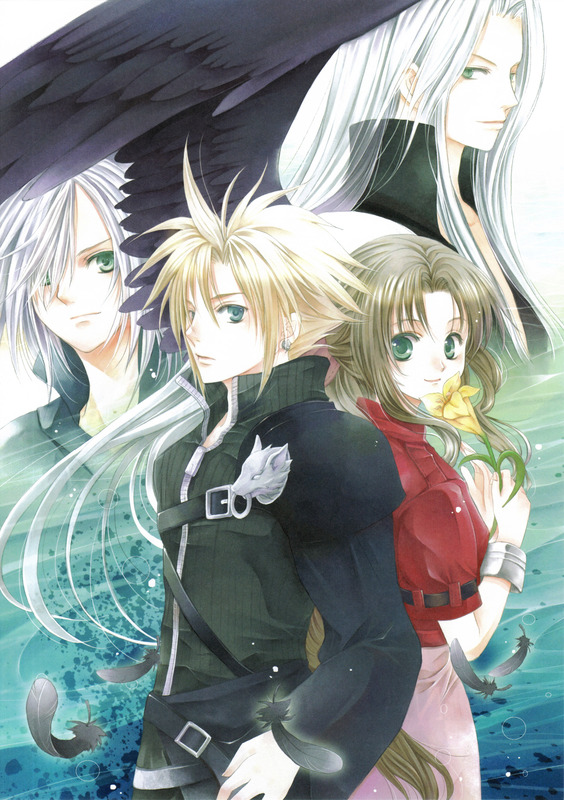 I really like how Kadaj, Seph and Cloud look here. Wow! I love it. This a great picture that i saw. You sharing a great scan again( i can remember.) Thank you so much and i waiting for a next scan. Very nice pic. Although I haven't see Advent Children yet (eventhough I've had it since it came out) I love this pic. But who is that guy on the left next to Cloud? Great scan. I like the anime style on this FFantasy pic. I love that pic! Tifa is missing but i still love it! thanks!